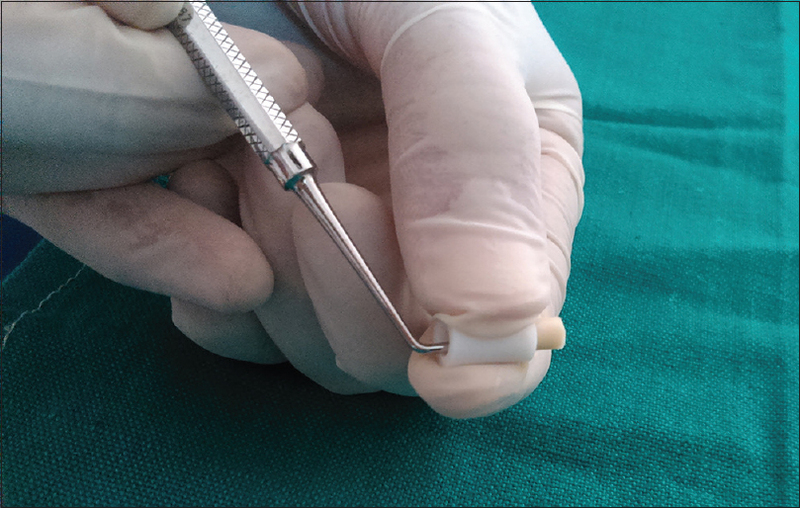 Background: New attachment systems are released for mandibular two-implant overdentures often without evidence-based support. Biomaterial aspects are now the parameters considered when choosing the appropriate attachment. Studies regarding their properties remain scarce. Purpose: The purpose of this review was to help the clinician in selrcting the most adapted stud attachments according evidence-based dentistry. Materials and Methods: An electronic search was conducted using specific databases (PubMed, Medline, and Elsevier libraries). Peer-reviewed articles published in English up to July 2014 were identified. Emphasis was given on the biomaterial aspects and technical complications. No hand search was added. Results: The electronic search generated 115 full-text papers, of which 84 papers were included in the review. The majority were clinical and in vitro studies. Some review articles were also considered. Papers reported survival and failures of overdenture connection systems. Emphasis was laid on attachment deformation. Conclusion: Implant overdentures long-term follow-up studies may provide useful guidelines for the clinician in selecting the type of attachment system and overdenture design. Locator attachments are more and more used, with lesser complications reported. Osteoporosis is a major health problem affecting one in three women over the age of 50 and may not be detected until fractures occur. Since osteoporotic fractures are a health burden worldwide, identifying subjects with a high risk of osteoporosis and preventing osteoporosis-related mortality and morbidity are a very important health strategy. Women show an estrogen-related bone loss starting at menopause, predominantly occurring in trabecular bone. Diagnosis of osteoporosis is usually based on the bone mineral density measurement, but this is not a practical and economical technique for early detection. Therefore, investigators are interested in the possibility of detecting osteoporosis from the panoramic radiographs. Mandibular cortical bone undergoes resorptive activity in osteoporotic patients, leading to a decreased thickness and more porous inferior border. Therefore, studies have demonstrated the usefulness of cortical width and shape, determined from panoramic radiographs, in identifying elderly individuals with undetected osteoporosis, especially postmenopausal women. In conclusion, postmenopausal women with C3 category, Mental Index (MI) <3 mm, and panoramic mandibular index (PMI) <0.3 may be considered for further osteoporosis investigation. Objective: To evaluate the antimicrobial efficacy and compressive strength of conventional glass ionomer cement (GIC) containing chlorhexidine and antibiotics at varying concentrations. Materials and Methods: Chlorhexidine diacetate and antibiotics (ciprofloxacin, metronidazole, and minocycline) were incorporated into GIC Fuji IX at 1.5% and 3% w/w ratio to form the experimental groups. The experimental GIC specimens were placed on brain heart infusion agar plates inoculated with Streptococcus mutans, and the area of inhibition was measured after 48 h. The 24-h compressive strength of the set specimens was evaluated using a Universal Testing Machine. Results: The control group demonstrated no zone of inhibition. All experimental groups showed inhibition against S. mutans (P < 0.05), with larger zones of inhibition found in the higher concentration groups. Compressive strength at the end of 24 h decreased in the experimental groups as compared to the control group (P < 0.05), but no difference was found between the experimental groups (P > 0.05). Conclusion: The present study demonstrated that experimental GICs containing chlorhexidine diacetate and antibiotics were effective in inhibiting S. mutans, and incorporation of 1.5% ABX was optimal to give the appropriate antibacterial and physical properties. Background: Potentially malignant disorders like oral submucous fibrosis (OSMF) often precede oral squamous cell carcinoma (OSCC). The rate of transformation of OSMF to OSCC ranges from 3 to 19%. OSMF is etiologically related to chewing of areca nut (betel nut), and the high copper content in areca nut plays an important role in the pathogenesis of the disorder. 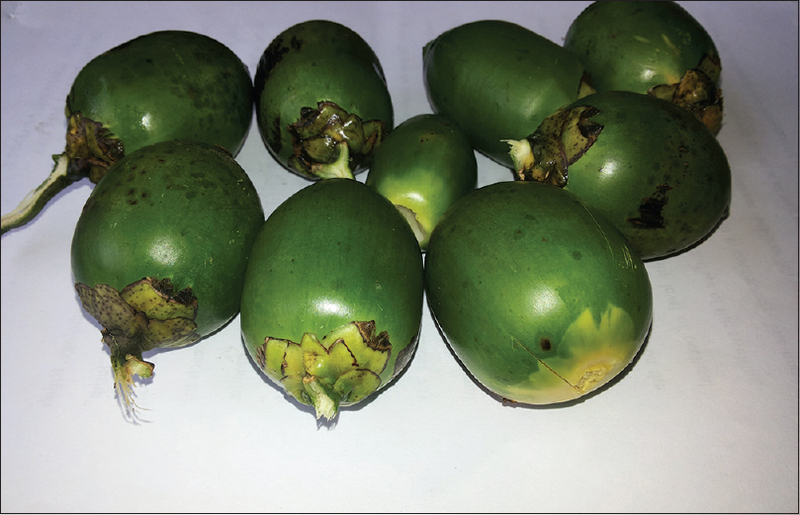 Even though many studies estimated and confirmed increased copper levels in areca nuts, studies tracing the source of the increased copper content are scarce. Interestingly, on review of agricultural literature, it was found that most of the areca nut plantations in South India commonly use a copper-based fungicide, bordeaux mixture (BM). Aim: The aim of the study was to estimate and compare the copper content in areca nuts from plantations with and without copper-based fungicide usage. Materials and Methods: Four areca nut plantations from Dakshina Kannada district, Karnataka (group A) and four plantations from Ernakulam district, Kerala (group B) were selected for the study. The plantations from Karnataka used copper-based fungicide regularly, whereas the latter were devoid of it. Areca nut samples of three different maturities (unripe, ripe, and exfoliated) obtained from all plantations were dehusked, ground, and subjected to atomic absorption spectrometry (AAS) for copper analysis. Results: There was statistically significant difference in the copper content of areca nuts from both groups. The areca nuts from plantations treated with copper-based fungicide showed significantly higher copper levels in all maturity levels compared to their counterparts in the other group (P < 0.05). Conclusions: The high copper content in areca nut may be related to the copper-based fungicide treatment on the palms. These areca nuts with high copper content used in quid or commercial products may be responsible for the increasing prevalence of OSMF. Objectives: The purposes of this study were to investigate the factors influencing the career choice of dental students and to identify the future life plans of the students at Prince Sattam Bin Abdulaziz University Dental College who had chosen orthodontics as their future specialty. Materials and Methods: An epidemiological descriptive survey was conducted using a set of questionnaire among the second year to fourth year students at Prince Sattam Bin Abdulaziz University, Al Kharj, Saudi Arabia. Data were categorized by demographic variables and were analyzed with statistical methods using descriptive statistical analysis. Results: The most important factor influencing the decision to pursue specialty in orthodontics was considering that "orthodontics is intellectually challenging" (23%), followed by "previous positive experience" (15%). The decision to become an orthodontist was made by 3.7% of the respondents in the first year of their course, 44.4% in the second year of their study, 11.1% during the third year of their study, 25.9% during the fourth year of their study, while none of them had made their decision during the final year of their dental school studies. Only one student (3.7) said he planned to work in a private college in an academic setting, five students (18.5%) had plans to do private practice, two students indicated that they would work for the Ministry of Health, while most students (40.7%) reported that they were planning to try a combination of all of the above. Six students (22.2%) remained undecided. 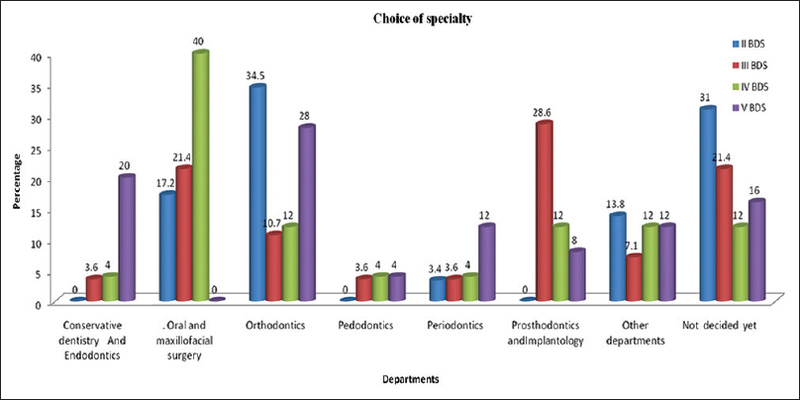 Conclusions: Majority of the students who had chosen orthodontics as their future specialty of choice at Sattam Bin Abdulaziz University Dental College, Saudi Arabia had taken up this specialty as they felt that orthodontics was intellectually challenging. Objectives: To determine whether there is a difference between state-funded childcare centers and non-state-funded centers in Wisconsin, USA, with regard to their oral health practices. Materials and Methods: This is a cross-sectional study using an internet-based survey. The participants were licensed childcare centers in Wisconsin, USA. Of the 1265 eligible childcare centers invited (centers providing day time care to children aged 2-5), 322 chose to participate. The main outcome measures were the practice of tooth brushing as a routine classroom activity, any educational practice related to oral health, any screening and referral practice related to oral health issues, and any practice related to dental emergencies. Mediating variables were profit status, center location, center affiliation, years of operation, licensed capacity, and child to staff ratio. Results: Of the 322 participating centers, 28 centers were classified as state-funded and 294 as non-state-funded. Logistic regression analysis revealed non-state-funded centers were three times [odds ratio (OR): 3.01; 95% confidence interval (CI): 1.23, 7.41] more likely to have some kind of oral health practice and five times (OR: 5.18; 95% CI: 2.17, 12.50) more likely to provide oral health education. However, state-funded centers were five times (OR: 5.09; 95% CI: 1.99-13.06) more likely to have tooth brushing as a routine classroom activity. Conclusion: There is a difference between the oral health practices of licensed childcare centers in Wisconsin. An increase in oral health practices of state-funded centers is warranted and could make a significant difference in the oral health of young children. Background: A number of natural mouth rinse formulations are being proposed as an alternative to the widely used chemical mouth rinses. Objective: To evaluate and compare the antimicrobial efficacy of chlorhexidine (0.2%), sodium fluoride (0.05%), fluoride with essential oils (0.05%), alum (0.02 M), green tea, and garlic with lime mouth rinses against Streptococcus mutans, lactobacilli, and Candida albicans. Materials and Methods: The three microbes were isolated from the saliva samples collected from children with severe early childhood caries. The zone of minimum inhibition was assessed using agar diffusion method. The data were statistically analyzed using SPSS software. 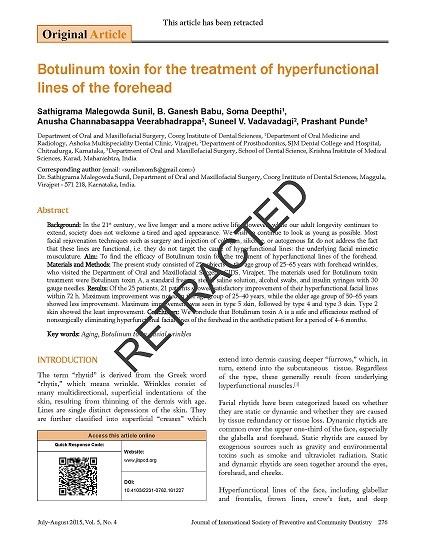 Results: Against S. mutans and lactobacilli, chlorhexidine mouth rinse was found to be the most effective as compared to sodium fluoride (P < 0.001, P < 0.001), fluoride with essential oils (P < 0.001, P < 0.001), alum (P < 0.001, P < 0.001), green tea (P < 0.001, P < 0.001), and garlic with lime (P < 0.001, P < 0.001) mouth rinses, respectively. But against C. albicans, garlic with lime mouth rinse was found to be the most effective as compared to chlorhexidine (P < 0.001), sodium fluoride (P < 0.001), fluoride with essential oils (P < 0.001), alum (P < 0.001), and green tea (P < 0.001) mouth rinses. 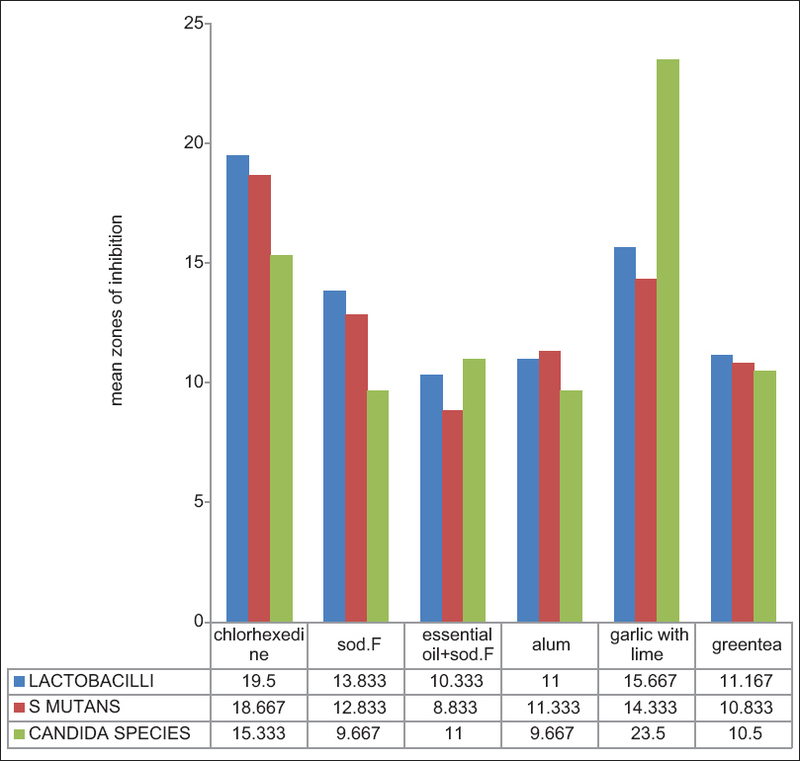 Against S. mutans and lactobacilli, after chlorhexidine mouth rinse, garlic with lime mouth rinse was found to be significantly more effective than sodium fluoride (P = 0.053, P = 0.001), fluoride with essential oils (P < 0.001, P < 0.001), alum (P < 0.001, P < 0.001), and green tea (P < 0.001, P < 0.001) mouth rinses. Conclusion: As a natural mouth rinse, garlic with lime mouth rinse was found to be the most promising. However, further studies are needed in this field. Background: Oral submucous fibrosis (OSF) is a disease of the oral mucosa characterized by excessive accumulation of subepithelial collagen, thereby resulting in severe limitation of mouth opening. In OSF, in response to inflammation, the body produces more fibrinogen and its degradation products. The plasma fibrinogen degradation products (FDP) have been reported to be early indicators of fibrin deposition. The present study was intended to ascertain the role of FDP in OSF. Materials and Methods: A total of 40 subjects were included in the study. The subjects for the present study were selected from the Department of Oral Medicine and Radiology. The subjects were divided into two groups. The study group comprised 24 subjects diagnosed clinically and histopathologically as OSF and were further divided into three clinical and histological stages of OSF. The control group comprised 16 age- and gender-matched healthy individuals. Five milliliters of venous blood was drawn from the antecubital fossa of all the participants. The blood samples were centrifuged at 1000 rpm for 5 min to separate plasma, and the plasma FDP levels were assessed. Results and Conclusion: There was a significant difference in the plasma FDP levels between the study group and the control group. There was a significant linear increase of plasma FDP levels with an increase in severity of the clinical stage of OSF. Comparison with the histopathological grades of OSF also showed an increase in FDP levels with higher grades of OSF and there was a good correlation between the clinical staging and the histopathological grading of OSF. Objective: The objective of this study was to compare the clinical and radiographic effects of Allium sativum oil and formocresol in nonvital pulpotomy in primary teeth. Materials and Methods: Twenty children ranging in age from 4 to 8 years were included in the study. 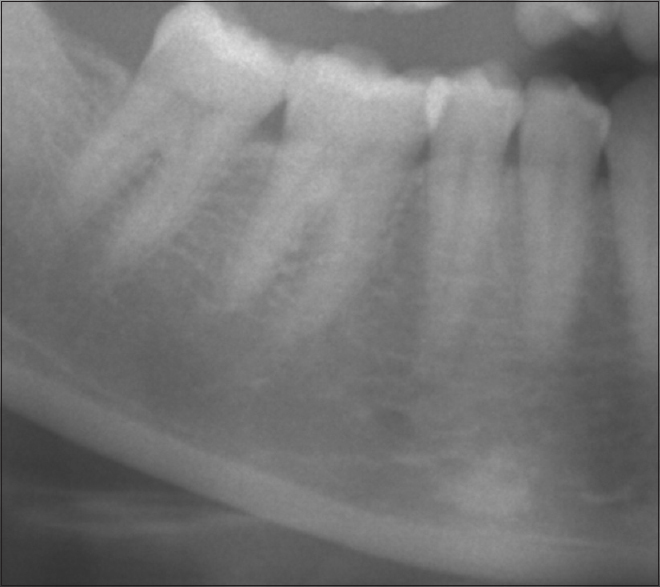 In every one of those children, pulpotomy was indicated for the primary molars. Pulpotomy procedure was performed and the radicular pulp tissue of one molar was capped with A. sativum oil in a cotton pellet while the other molar was capped with formocresol. The teeth were evaluated clinically and radiographically before and after 6 months using standard clinical and radiographic criteria. Statistically, these results revealed significant difference between the radiographic findings of nonvital pulpotomy in primary molars with the two medicaments. 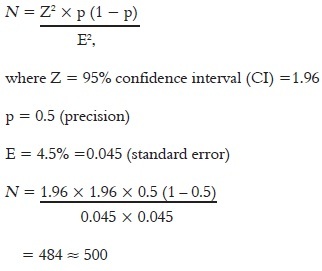 Statistical analysis was performed using independent t-test and paired t-test at the significance level of α = 0.05. Results: A. sativum oil has potent antibacterial properties that enable it to combat intracanal microbes in the infected pulp of primary molars. Better results were obtained when A. sativum oil was used. 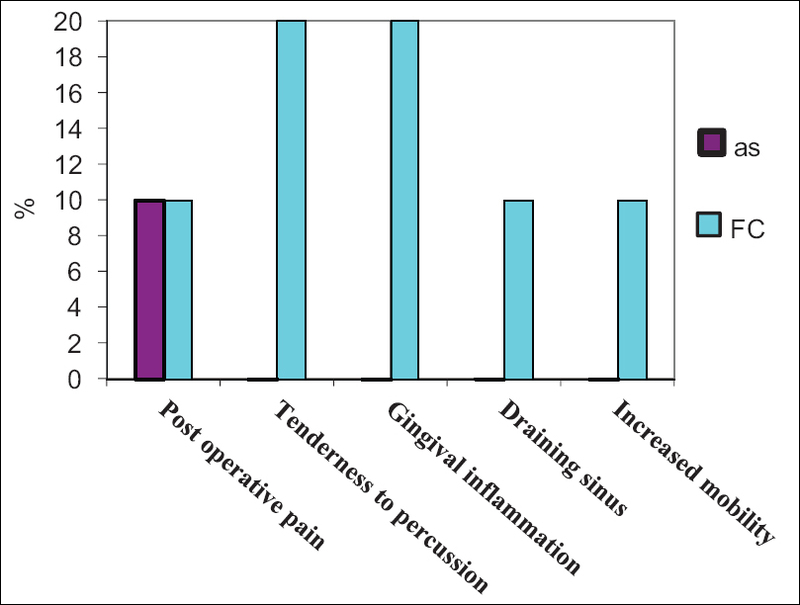 Conclusion: A. sativum oil had more powerful effects than formocresol on the infected pulp of primary nonvital molars. Background: The epidemic of tobacco use is one of the greatest threats to global health today. Tobacco attributable deaths in India currently range from 800,000 to 900,000 per year. Adolescents are among the most vulnerable group to start tobacco use. Information on tobacco use among the youth is necessary to establish control measures against it. Objectives: To assess the knowledge, attitude, and behavioral determinants of tobacco use among high school students (age13-15 years) in Bangalore. Materials and Method: A cross-sectional study was conducted over a period of 3 weeks in the month of September 2012. A structured, pretested questionnaire was administered randomly to 500 high school students in Bangalore to assess the knowledge, attitude, and behavioral determinants of tobacco use. Results: Majority of the study population [94.4% (472/500)] believed that smoking is definitely harmful to our health. Also, 39.0% of the participants of age 13 years believed that smoking does not help in socializing and 92.2% of study subjects had negative attitude toward starting the habit. Most of them (83.9%) had a negative perception about smokers that they lack confidence. However, less than 1% of the study population had a habit of smoking at this young age. Conclusion: Awareness of the harmful effects of smoking was high among the study population. The study provides insight into the factors to consider while planning adolescent anti-smoking programs in this and similar settings. 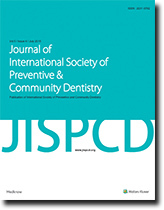 Background: Behavioral aspects play a major role in the prevention of oral diseases. Moreover, not many people are aware of the relationship of smoking with potential oral diseases. Therefore, the aims of this study were to analyze oral hygiene behavior, smoking habits, and perceived oral health problems among a sample of university students in Al-Kharj, Saudi Arabia. Materials and Methods: A self-administered questionnaire about oral hygiene behavior, smoking, and perceived oral health problems was developed. The questionnaires were mainly distributed in Medical, Dental, and Pharmacy colleges of the university. Questionnaires completed at other colleges were included under the term "other colleges." Results: Overall, 380 questionnaires were returned. 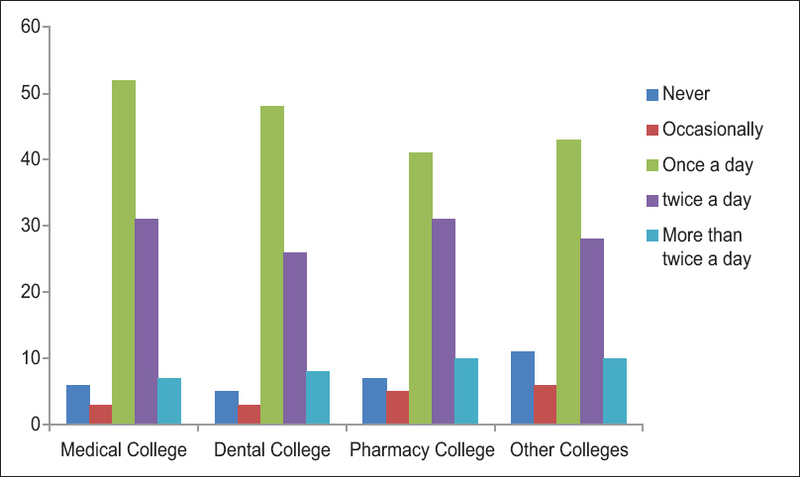 Majority of the students (92.4%) reported cleaning their teeth. Most of the students reported cleaning teeth once daily (48.7%). Just over a half (55.8%) reported having a dental check-up in the last 6 months, and a significantly higher number of dental students reported having a dental check-up (P < 0.05). Regarding smoking, the majority (63.4%) reported to have never smoked while 17.3% reported that they were smoking frequently. About 17.6% perceived oral health problems, including a significant proportion of those who reported frequent smoking. Conclusions: Oral hygiene behavior exhibited by the university students sample was similar. Majority cleaned their teeth, although only once. Smoking habit was not exhibited by the vast majority of students. Frequent smokers perceived oral health problems more than other students.